Is a family member or friend addicted to morphine? One way you can help is by showing support by learning about addiction. 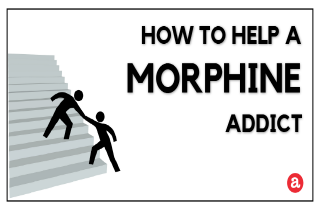 Learn more ways you can aid a morphine addict, here. Addiction affects us all. Especially if it’s in the family. But regardless of how much you love someone, you can’t force them to change. They have to want a new life for themselves. In the following article, we explain how you can help a morphine addict. Plus, we share a list of valuable resources such as people and places that you can contact for aid. Finally, we encourage you to please use the comments section at the end of the page. In fact, we welcome your questions. We try to provide a personal and prompt reply to all real-life situations! Is a loved one’s addiction out of control? We know addiction. We can help. 2. They are scared to face a life with pain (physical or psychological) again…without the help of morphine. The addictive potential of morphine is incredibly high. In fact, morphine is one of the most addictive drugs known to man. And while physical challenges can be uncomfortable, staying in the same place – stuck in a cycle of morphine addiction – might make the condition worse. How can someone get over these barriers? First, seek medical help. It is difficult to achieve long-term sobriety and avoid morphine relapse without the professional help of a reputable treatment program. It’s highly common for users to crave morphine due to the memory of how good it feels to be on morphine. For this reason, clinicians and scientists have developed a variety of effective treatments which aim to help addicts re-learn how to live without taking drugs. What does professional treatment look like? Treating a morphine addiction usually starts with detoxification. During detox, morphine leaves the body. Detox is most successful and safe when performed by medical addiction professionals. Unpleasant withdrawal symptoms are expected but can be treated as they occur. In fact, doctors can help manage the uncomfortable withdrawal symptoms with medications and psychological support (yes, medications exist to make withdrawal less intense and/or severe). Buprenorphine – Buprenorphine usually helps relieve withdrawal symptoms and is used in the longer-term management of severe drug dependence. Methadone – Methadone can be used during detox and as maintenance therapy during tratment. After stabilization, the dosage is gradually reduced until both morphine and methadone are out of the system. Clonazepam, trazodone, and Zolpidem – Each of these medications have been used for withdrawal-related insomnia, but the decision to use a benzodiazepine needs to be made carefully, as it can create a secondary addiction. Step #1 – Get informed. Before you set out to help your friend or loved one, make sure you are well informed about morphine addiction. Learn about how morphine affects the brain, what happens during withdrawal, and what happens during a craving. Get into the brain science of addiction and you’ll be much more informed to be a good guide. Step #2 – Approach the addict. The best way to approach a morphine addict friend or loved one is by learning how to use opportunities to express your concern. The CRAFT Model stands for “Community Reinforcement and Family Training.” This is a program that teaches loved ones how to stay safe around someone who’s using and to set limits. It shows excellent promise as a way of getting people into treatment and is often preferred to an intervention. However, you’ll need to invest 12-16 weeks as a family group in order for the program to be most effective. Step #3 – If all else fails, plan an intervention. An intervention is a face-to-face conversation between family members and the person with an addiction problem. Assisted by a professional interventionist, you can carry out the intervention in a safe and supportive manner. The professional interventionist will help you gather the best possible combination of people close to the addict and learn how you can start setting limits. Again, we suggest that you check out the CRAFT motivational and non confrontational model of interventions. CRAFT has a very high rate of success and empowers families and friends to take care of themselves during the course of an addict’s treatment. Q: Can you get off morphine on your own? A: Realistically, no. It’s possible but very difficult. If you are dependent on morphine, your body has adapted to the presence of this drug in your body. Because dependence involves brain chemistry – and morphine provokes high levels of dependence – it is not recommended that you attempt to come off morphine by yourself. It can be dangerous and uncomfortable to go through withdrawal alone. In fact, it’s best to seek help for morphine withdrawal from a doctor or detox clinic. Taper. Before you come off of morphine, start with a slow and gradual taper. Consult a pharmacist. Use the correct doses of over-the-counter medications. Again, consult a pharmacist. Ask a pharmacist about the use vitamins and natural supplements. Go alternative. Try complementary medicine such as acupuncture and Chinese herbal medicine. Balance the chemicals. Do things you enjoy because that way you’ll increase your body’s endorphins. NOTE: Only withdraw from morphine on your own if you get your doctor’s clearance, get a tapering scheduled designed specifically to your individual needs, and have someone who can be by your side during this period in time. Be extremely careful when reading detox recipes and stories on online forums about home withdrawal. They are usually not medically tested for safety or efficacy! Rehab treatment centers in your area. Doctors experienced with morphine addiction. Psychologists and psychiatrist that help people deal with the mental issues behind addiction. Our drug hotline. We are available 24. It is important to keep this in mind when considering how to help a friend or a loved one: A person needs to be willing to change! Repeat these phrases to yourself, or keep them written down for when you’re ready to open up a discussion. Still have questions about helping a morphine addict? Please leave them here. We will try to answer all legitimate inquiries personally and promptly. In case we don’t know the answer to your particular question, we will gladly refer you to professionals who can help. Stanger. Louise. Learn to Thrive: An Intervention Guidebook for Loved Ones and Their Families. I have some questions regarding how I can care for my own mental health, while helping my loved one with their addiction. I’m currently helping them threw withdrawal and trying to get on track with their med schedule and tapering plan. However I find myself feeling emotionally drained and don’t want to lose my temper or cool while trying to be positive for this person. Yet I feel very taken for granted at this point. Basically how can help them and not seem like a nag?